Isaac Brieske and Donavon Armbruster in “The Drawer Boy.” Photo by Benjamin Barlow. In the early 1970s a group of documentary style theater-makers from Toronto journeyed to rural, southern Ontario to observe, interview, and live with local farmers. Their impressions of this bucolic life were used to create a play called the Farm Show, performed by the citified actors for the very audience it was modeled on. Decades later, playwright Michael Healey took inspiration from this dramatic experiment to create a stunningly beautiful play called The Drawer Boy, onstage through September 29th on the Drury Stage at the Bartell. Strollers Theatre could not have chosen a more eloquent way to start their season than with this poignant play that explores our universal need for stories — the ones we’re given, the ones we create, and the ones we fabricate to replace a truth that’s just too difficult to live with. 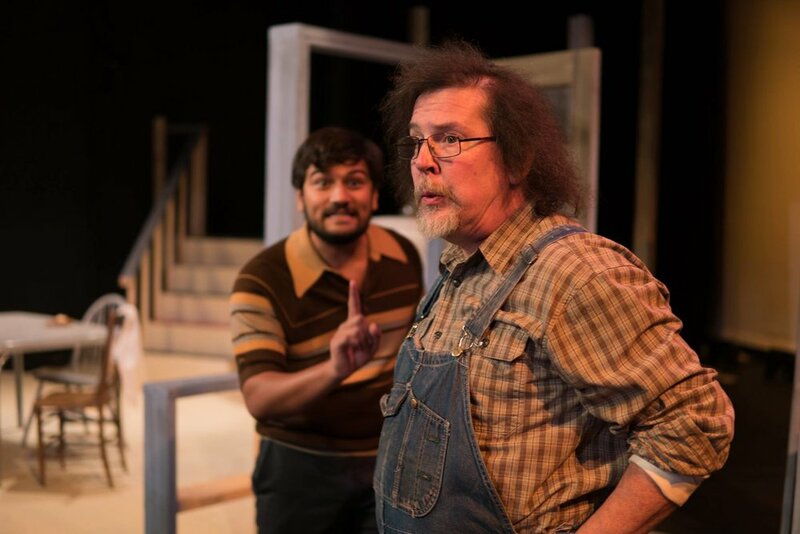 Set in the mid-1970s, the show begins with the over-eager aspiring thespian Miles (Isaac Brieske) arriving at an honest-to-goodness farm that will provide inspiration for his playwriting. He waves happily at cows, inhaling the dairy air, and generally geeking out about being so close to where his food comes from. His romantic fascination with working the land is at first baffling to the bachelor famers Miles has come to stay with. His mere presence seems confusing for the gentle, soft-spoken, overall-wearing Angus (Donavon Armbruster). But it’s an excuse for mischief as Morgan (Sam D. White) preys upon his urban pupil’s naiveté. White tries carefully to conceal a smirk each time he assigns an “authentic” farm chore to the precocious actor, such as shuffling the eggs beneath each of the chickens, hand washing individual pieces of gravel and mucking out the barn with a fork. Like a cat playing lazily with a relentlessly enthusiastic mouse, White relishes doubling down on the tall tales. These stories seem harmless — a classic trick to play on outsiders — and even more fun for a Midwestern audience, since we all know that farm life isn’t the stuff of epic poetry. And theater people will easily recognize the earnestness of a young performer who is utterly misguided in his zeal to transform LIFE into ART. But as Miles and his troupe develop their show, the stories told back and forth among the actor and the farmers get darker, and the closer they come to the truth, the more consequences there are. As Miles, Isaac Brieske is a bundle of enthusiasm that yearns to emote onstage. His mini dance performance piece about the angst of milk cows is hilarious, due to Brieske’s sincerity to communicate the essential bovine experience. But more than the facilitator of a larger story — the stranger who uncovers the true history that the two farmers have with each other — Brieske does a complicated dance with his research subjects. More emotionally entangled with the two men each day, he alternately worships them, belittles them, shows his own sharp edge of self-interest by betraying their trust, and finally cares more about both of them than completing his theater project. Sam D. White brings both his characteristic love of shenanigans and his full-throated anger to the part of Morgan, the caregiver for both the farm and his brain-injured war buddy Angus. In addition, White brings a gentle, fiercely protective sensibility to a man who has navigated a path through guilt and tragedy, and whose way of life is being threatened by economic uncertainty. White pivots from bright words of encouragement for Angus to searing threats to Miles in a heartbeat, with great intention and control. The tender heart of The Drawer Boy belongs to Donavon Armbruster as Angus. Robbed of his long-term and short-term memories by a bomb blast during World War II, Angus suffers from a loss of self. He gets along with Morgan’s help, still able to do complex math and fascinated by counting stars in the night sky. But when Miles’s play triggers Angus to recall pieces of his past, it is both glorious and harrowing. Armbruster leads the audience gently along this on his journey, feeling every fresh pain as he remembers it, pulling us into his overwhelming desperation and despair. The transformation from kind and innocuous uncle to a prisoner of his own past, howling in frustration, is heartbreaking. It’s a credit to director David Pausch, the cast, and the delicately wrought script that each of the three characters is so complicated —all have made mistakes and none are painted as villains for them. The current production is also assisted by the realistic kitchen of a country farmhouse awash in the golds of twilight (set by Teresa Sarkela, lighting by Steven Peterson) and the original music composed for the show by Erin McConnell and Evan Lange. The jaunty Celtic airs set the scene and the mood, altering as the play progresses, to reinforce the swirling discord beneath a placid veneer. On opening night there were a few pacing problems, including overly long pauses between short opening scenes, and a somewhat sloppy climax that will likely tighten up over the course of the run. These are small criticisms of an important story about the importance of stories that will stay with you long after you leave the theater.